We delivered a page turn effect that offered a great reader experience. Many businesses choose to communicate electronically instead of using printed media. This can be a more cost-effective way of communicating, but documents need to engage your audience. Adding a page turn effect brings a document to life, simulating the experience of flicking through a printed document. The page turn effect can be applied to any PDF document to deliver a great reader experience. In addition to being able to ‘pick up’ the corner of a page and flick forward and back through a document, there are other additional features and functionality that can be added. 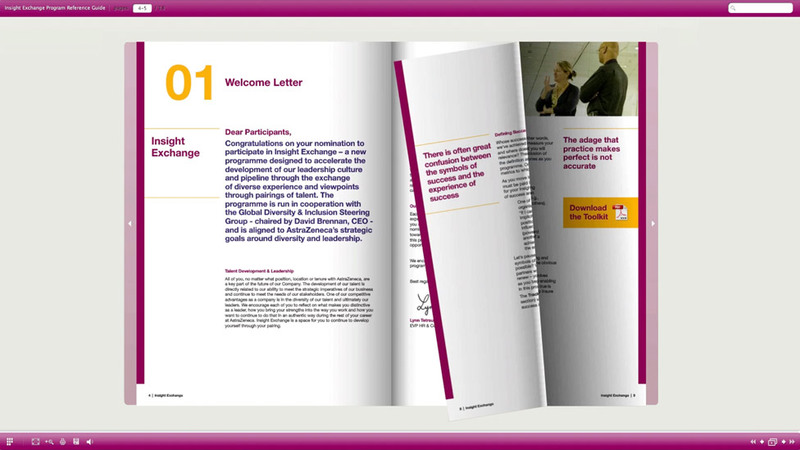 For this particular page turn effect document for AstraZeneca, we customised the background colours using their brand colour palette, and added a search facility allowing readers to search for a keyword anywhere within the document. We also added a side bar menu that allowed users to navigate via thumbnail images of each spread, together with the ability to print or download a non page turn effect version of the original PDF document. A digital annual report design that highlights commitment to customer satisfaction and focus on performance. Ocean Spray were looking for a more cohesive way for their sales team to show information to clients. By creating slick interactive content we offered a presentation design solution that could be adapted for a global audience.